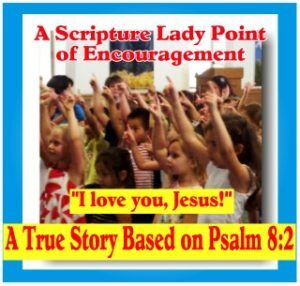 Here is a true story based on Psalm 8:2 that will hopefully inspire you to pray for your children to lift up praises to Jesus within your homes and classrooms. Today, I want to share a true story based on Psalm 8:2 during one of my most recent chapel programs. I had just finished presenting a very visual explanation of how Jesus washes our sin away when a little girl in the front row proclaimed, “I love you, Jesus!” It was a truly precious moment for me and it was also an answer to prayer. The morning of this little girl’s praise of adoration to Jesus was spent like I normally do. I usually take some time to read the Bible and spend time with Jesus before the day begins. On this particular morning, I found myself reading Psalm 8:2 – again. How powerful and wonderful our God is to use a small child to bind our Lord’s enemies! So, on this particular morning I prayed and asked God to move the children that I would share with to give glory and praise to Jesus. God answered my prayer and I am so thankful for that precious young child’s heart of love who was led by the Holy Spirit to proclaim God’s praise. Do you have a story of children spontaneously offering praise to God that you could share down below in the comments area to encourage the rest of us? I know I would LOVE to hear it! 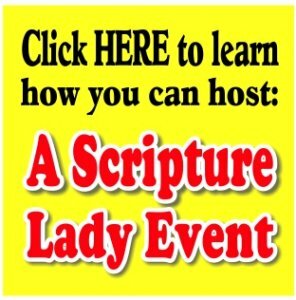 If you liked this article about a true story based on Psalm 8:2, then sign up to receive Scripture Lady’s Free Email Kid Tips packed full with creative ideas and receive 12 FREE Bible downloadable resources to help get the kids you minister to excited about the Bible! Just go to www.MyFreeBibleGames.com to fully subscribe.